Thanks to Dr. Ankur Sangoi, El Camino Hospital, California (USA) for contributing this case and Dr. Hillary Kimbrell, Myriad Genetics, Inc., Utah (USA) for writing the discussion. To contribute a Case of the Week, follow the guidelines on our main Case of the Week page. Lung pleuropulmonary blastoma - type II: gross and micro images; type I: gross images. If you own images of these entities, please email them as attachments to Dr. Nat Pernick at NatPernick@gmail.com, with any relevant clinical history. There is no payment for image contributions, but we will acknowledge you as contributor, so please indicate how you want your name to be displayed. 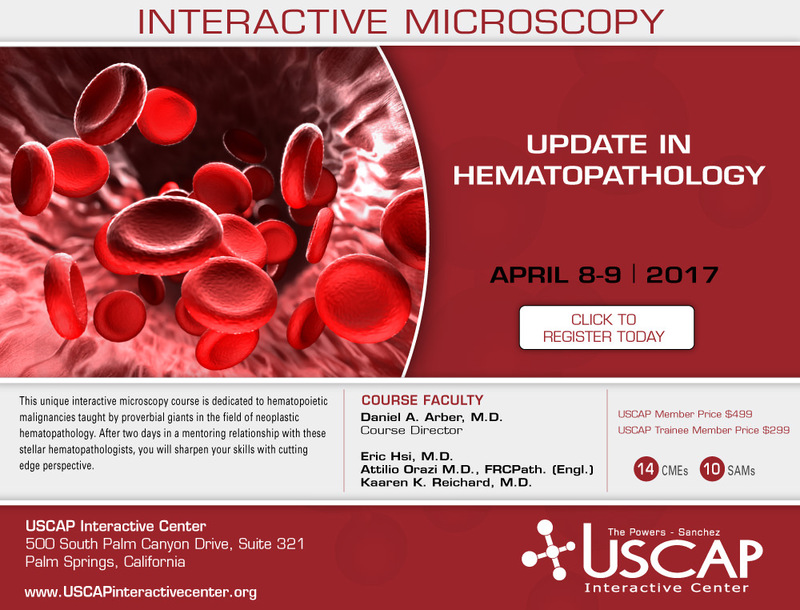 (2) You can sign up for our What's New in Pathology Newsletter here. It is sent quarterly and written by members of the PathologyOutlines.com Editorial Board. (3) We have added new books to our Books page. 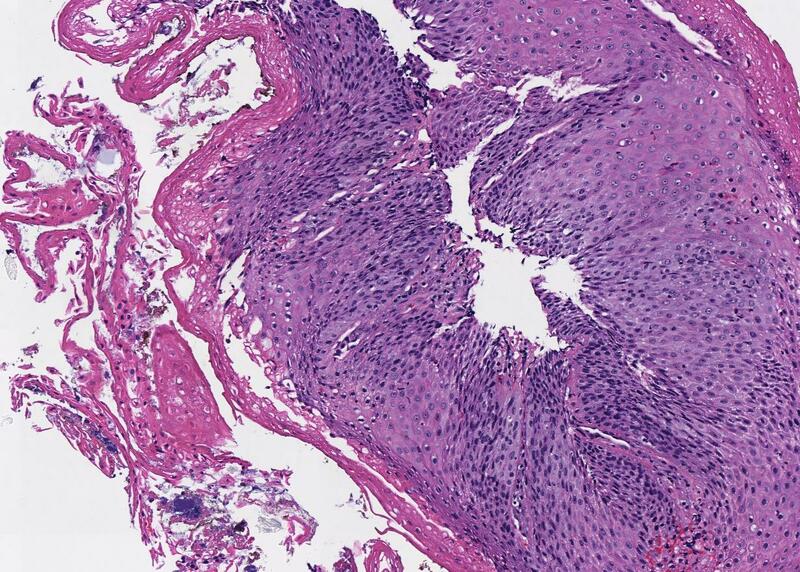 A 67 year old man had an unusual appearing esophagus on endoscopy, which was biopsied. Clinical impression was rule out ulcer vs Candida. Which of the following is true of esophagitis dessicans superficialis (EDS)? Esophagitis dissecans superficialis (EDS), also known as sloughing esophagitis, is an unusual disease with an unknown etiology. The clinical presentation varies from no symptoms (i.e., an incidental finding during endoscopy for other reasons) to vomiting up large casts of esophageal mucosa. The endoscopic appearance is characteristic: long, vertical white strips of peeling mucosa are seen, with underlying normal appearing mucosa (see figure 3 of Dig Dis Sci 2015;60:2049 and figure 1 of Am J Surg Pathol 2009;33:1789). The strips tend to peel from proximal to distal, and may retain a distal attachment point. EDS has been described as an "esophagus... filled with gift-wrap paper" (Am J Surg Pathol 2009;33:1789). It has also been likened to lizards shedding their skin. Typically the middle and lower third of the esophagus are involved. The average age of patients in larger case studies is in the seventh decade, but other demographics such as race and gender vary by study site (Dig Dis Sci 2015;60:2049, Am J Surg Pathol 2009;33:1789). 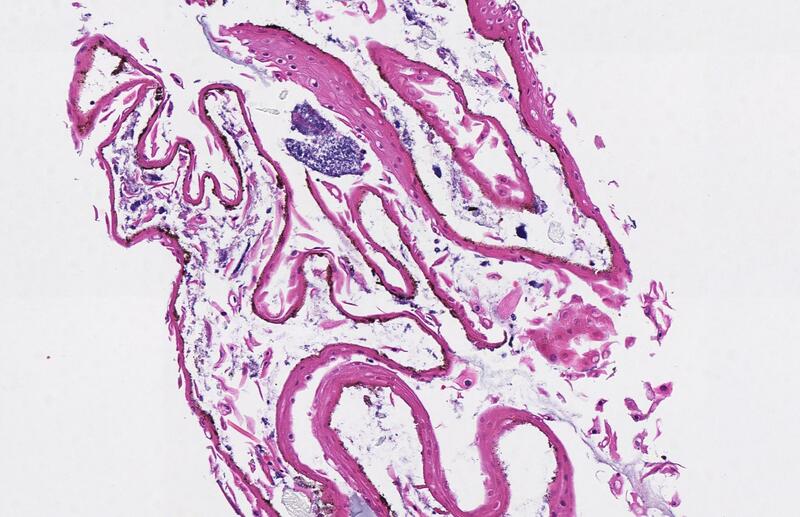 The histologic features of EDS include splitting of the epithelium at different levels above the basal layer, and variably sized cysts and bullae (termed “intraepithelial cystic degeneration” by Hart et al, Dig Dis Sci 2015;60:2049). Basal cell hyperplasia is present in some biopsies, such as the current case. A thick layer of parakeratosis is present (creating the white appearance on endoscopy), and the parakeratotic layer often separates off into necrotic fragments. Fungal or bacterial colonies can be associated with the loose fragments, but inflammation is minimal or focal. Frank ulcers should not be present (Dig Dis Sci 2015;60:2049, Am J Surg Pathol 2009;33:1789). The presence of especially long (>2 cm) detached strips is most suggestive of EDS, because small fragments of mucosa may become dislodged due to the endoscopic procedure or from tissue processing. 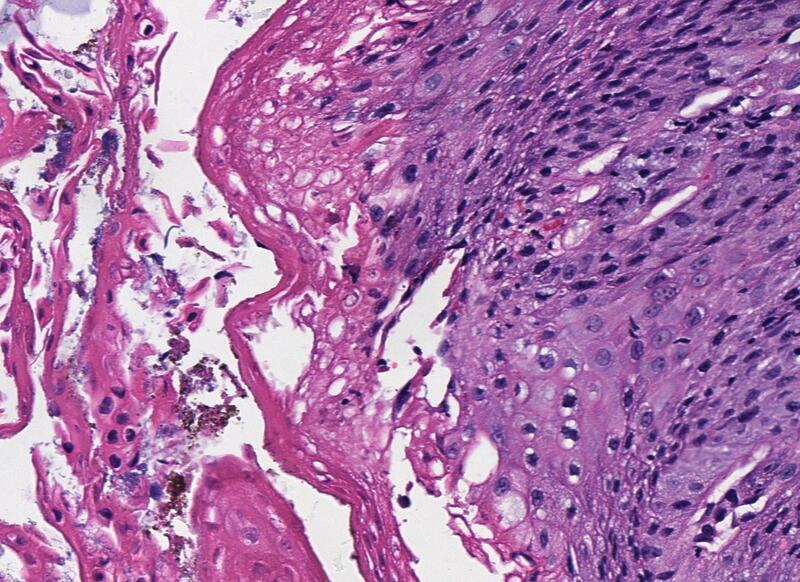 Correlation with endoscopic and clinical findings is recommended to rule out other conditions with similar histology, such as Candida infection, strictures and vesiculobullous skin diseases (Stevens-Johnson syndrome, pemphigus, pemphigoid). Immunofluorescence for complement and immunoglobulin deposits helps exclude the latter (Dig Dis Sci 2015;60:2049, Am J Surg Pathol 2009;33:1789). The etiology of EDS is unknown. 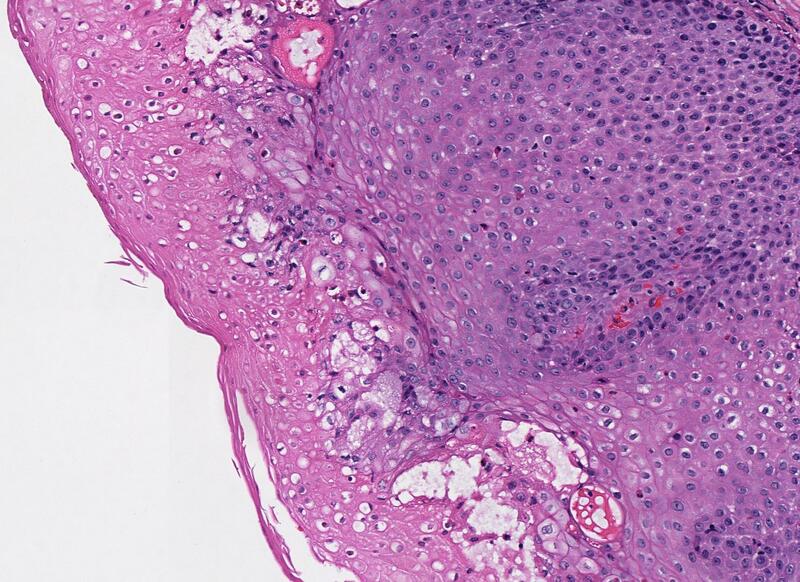 Its histologic similarity to contact dermatitis suggests exposure to an unidentified topical allergen. One study found high rates of selective serotonin reuptake inhibitors (SSRI) and serotonin-norepinephrine reuptake inhibitors (SNRI), although there is no obvious reason for this association (Dig Dis Sci 2015;60:2049). Other associated conditions are caustic medications (especially bisphosphonates), prior trauma, underlying esophageal motility disorders, smoking, immunosuppression, celiac disease, concurrent skin conditions and impaired mobility, but they are not clearly causative. Fortunately, EDS typically resolves completely after treatment with proton pump inhibitors, and discontinuation of possibly offending medications, and does not seem to have any long term sequelae (Dig Dis Sci 2015;60:2049, Am J Surg Pathol 2009;33:1789).